Focaccia (pronounced "fuh-KA-cha") is a type of Italian yeast bread baked in flat sheet pans. 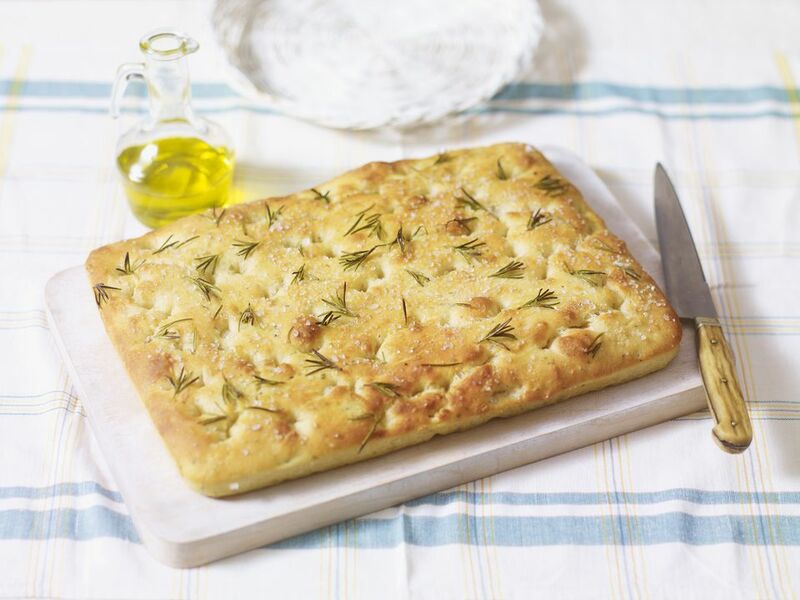 Focaccia dough is flavored with olive oil and sometimes topped with herbs and other vegetables. Focaccia bread is made using a strong flour, such as bread flour which is high in gluten. The dough is rolled out, placed into the sheet pan and then brushed with a generous amount of olive oil. After the dough proofs for about an hour or two, the baker will use fingertips to press little dimples into the focaccia dough. The focaccia dough is then topped with coarse salt and herbs, frequently rosemary, and any other toppings. It is then baked in a very hot oven or hearth. A pizza oven can be used or a home oven will work. The key is to have a very hot oven. It's recommended that to make focaccia at home, the oven should be pre-heated to 475 degrees Fahrenheit. There are many variations on the traditional (or plain) focaccia. One way to add other flavors is with toppings. Common focaccia bread toppings include olives, mushrooms, green onions, or tomatoes. Rosemary focaccia is also quite popular and sage is another herb that is often used instead of rosemary. In Italy, there are a lot of regional based focaccia variations. For example, in the Northwest of Italy, there is a popular recipe for focaccia dolce (sweet focaccia). It's made with a focaccia base that is sprinkled with sugar and incorporated into the dough are raisins, honey, or other sweet ingredients. Focaccia bread can be eaten as it is. It can be cut into a variety of shapes, including squares, long skinny rectangles, triangles. Because it is pretty thick, focaccia can be sliced in half and used for making sandwiches. It's also a tasty addition to a bread basket or an accompaniment to a bowl of soup or a salad. A sweet version of focaccia can be eaten for dessert or even for breakfast as a replacement for toast. Ideally, fresh focaccia should be eaten the day it is made. If you do have leftovers, wrap it up in a bread bag or sealed zip-top bag. Because of the high olive oil content in the dough, it won't go stale as quickly as other types of bread. Large pieces or slabs of focaccia can be wrapped in foil and frozen. Smaller pieces of stale focaccia can be toasted in an oven to make tasty croutons or crushed in a blender or food processor to make homemade breadcrumbs. If the focaccia has vegetables or other toppings on it, the toppings may not be good for the breadcrumbs. If you can remove them from the stale focaccia, do so before pulverizing your stale bread. If you have a large quantity of sweet focaccia leftover, consider making it into a sweet bread pudding.